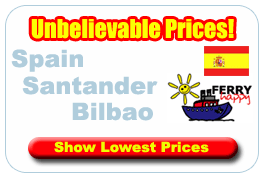 Travelling to Spain by sea is easy with P&O Ferries Ferries docking at the beautiful port of Bilbao in the Basque Country of Southern Spain.Why not book your cheap Ferry to Spain online today.If you'd like to travel to Spain by Ferry from the UK you have two routes and three operators to choose from. Brittany Ferries operate the Plymouth to Santander service twice a week, three times a week in high season. On-board the 'Pont Aven' accommodation is compulsory and ranges from a reclining seat to a deluxe cabin. The journey time is approximately 18 hours. P&O ferries to Bilbao operate a Portsmouth to Bilbao service every 3 days during peak season. The journey time on the luxurious 'Pride of Bilbao' is between 29 and 35 hours depending on conditions. Very popular service with mini cruisers. Prices include accommodation. AT Ferries is a major Spanish ferry company offering services between Portsmouth and Bilbao on their superferry, the 'Fortuny'. It has a 1000 passenger capacity and can accommodate upto 330 cars, caravans and coaches. Very comfortable crossing with excellent onboard facilities. Spain is still today one of the uk's favourite holiday destinations having everything from the weather to the entertainment to the attractions.In the cities you narrow twisting old streets which suddenly open out to views of daring modern architecture, while spit-and-sawdust bars serving wine from the barrel rub shoulders with blaring, glaring discos.Culturally, the country is littered with superb old buildings, from Roman aqueducts and Islamic palaces to Gothic cathedrals. Almost every second village has a medieval castle. Spain has been the home of some of the world's great artists - El Greco, Velázquez, Goya, Dalí, Picasso - and has museums and galleries to match. The country vibrates with music of every kind - from the drama of flamenco to the melancholy lyricism of the Celtic music and gaitas (bagpipes) of the northwest.